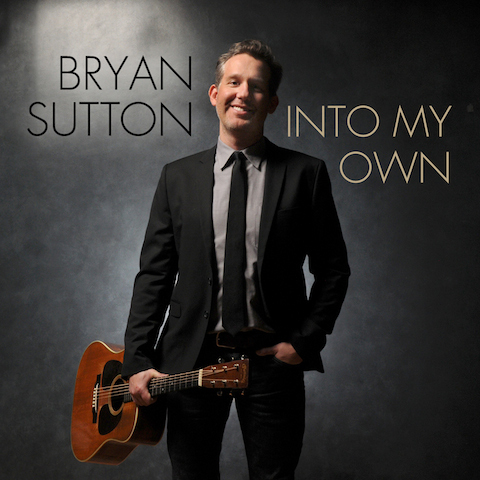 Bryan Sutton returns to Sugar Hill Records with his fourth solo release, Into My Own, available 29th April, 2014. “The goal,” Bryan Sutton says,“was to try to make a record that only I could make.” Indeed, even a cursory listen is enough to establish that Into My Own, his fourth album for Sugar Hill Records, fulfills that goal—and does so in a way that reflects not only the instrumental virtuosity that his admirers have come to expect, but also the spirit and sensibilities of a musician intent on challenging himself to continuously grow in every way. For those who think of him as just one of the best acoustic guitarists around, Into My Own will come as an unexpected revelation, while for those who’ve been following his evolution at least since 2009’s Almost Live, it deserves welcome as the culmination of a remarkable musical growth spurt—rich, varied, and, just as he says, a record that only he could make. For what Into My Own does for the first time is present Bryan Sutton, not so much on his own (though there’s a bit of that too), but as an artist who’s worked his way into a musical place that’s all his own, and not just as a phenomenal guitarist, but as a singer and songwriter. Featured alongside Bryan Sutton are some of the best pickers in the genre, also true friends and collaborators; Bill Frisell joins in for “Frissell’s Rag” while Noam Pikelny, Sam Bush, Ronnie McCoury, Stuart Duncan and more stop in to play a few. Sutton takes center stage on “Run Away” and “Been All Around This World,” demonstrating even further how each track bursts with its own energy. In addition to past and present touring with musicians such as Chris Thile, Earl Scruggs, Hot Rize, Ricky Skaggs and others, Bryan Sutton is one of Nashville’s most in-demand session players and producers, recently taking the helm on Della Mae’s Grammy nominated This World Oft Can Be. Sutton earned a Grammy for Best Country Instrumental category for his duet on “Whiskey Before Breakfast” with Doc Watson in 2007. He has received two Grammys in the past for his participation in Ricky Skaggs’s Kentucky Thunder and is has been recognized as the International Bluegrass Music Association’s Guitar Player of the Year six times over. “That’s one of the lessons of bluegrass,” he concludes. “Nobody gets here by accident. You’ve got to prove yourself, and you’ve got to continue to prove yourself. I’ve absorbed that, and I want to be that way.” If there’s any doubt, Into My Own should resolve it once and for all. For more on Bryan, check www.bryansutton.com or www.facebook.com/bryansuttonmusic.